I spend much of my time learning, making sense of things, and sharing what I’ve learned. I like connecting with other people who think about how they do this. I chatted with Harold Jarche about how he manages his 10-year blog archive. We thought it might be good to describe our knowledge management processes in more detail. Here are more details on mine! One of the things I’m working on as part of this 5-year experiment is to be more proactive about learning. It’s easy to fall into relying on client requests or a serendipitous stream of updates to teach me interesting things. It takes more work to observe what’s going on and come up with my own questions, ideas, and experiments. I think learning how to do that will be more interesting. I used to get most of my information through reading. I love being able to slurp a book and take advantage of someone else’s experience. I turn to the Web for more current or on-the-ground information. I read social network updates and blog posts to find out about things I didn’t even think of searching for. I’m learning more about asking people. There’s a lot written down, but there’s also a lot of knowledge still stuck in people’s heads. Asking helps me pull that out into a form other people can learn from. Trying things myself helps me test knowledge to see if it makes sense to my life. I learn how to adapt things, too, and I might even come up with my own ideas along the way. Sometimes I get interesting questions through e-mail, comments, or other requests. Those are worth exploring too, since explaining helps me understand something better. I fill in gaps in my understanding, too. Many of my blog posts are reflective. I think out loud because that helps me test whether I make sense. Sometimes other people help me learn or think my way through complex topics. A public archive is helpful, too. I can search my thoughts, and I’m relatively confident that things will continue to be around. The main challenge I’m working on is getting better at “chunking” ideas so that I can think bigger thoughts. 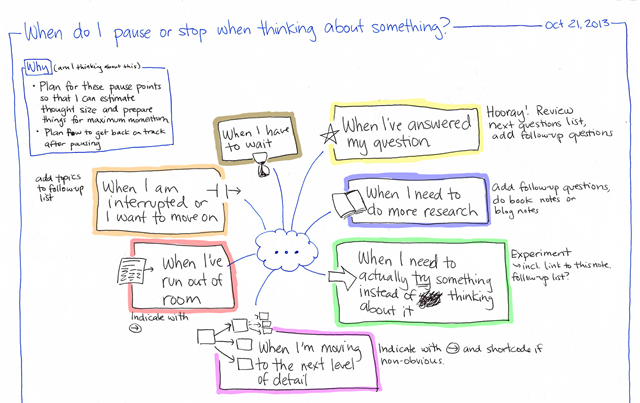 I’m comfortable writing my way through small questions: one question, one blog post. As I accumulate these posts, I can build more complex thoughts by linking to previous ones. Sketches help me chunk ideas. Like blog posts, each sketch addresses one idea. 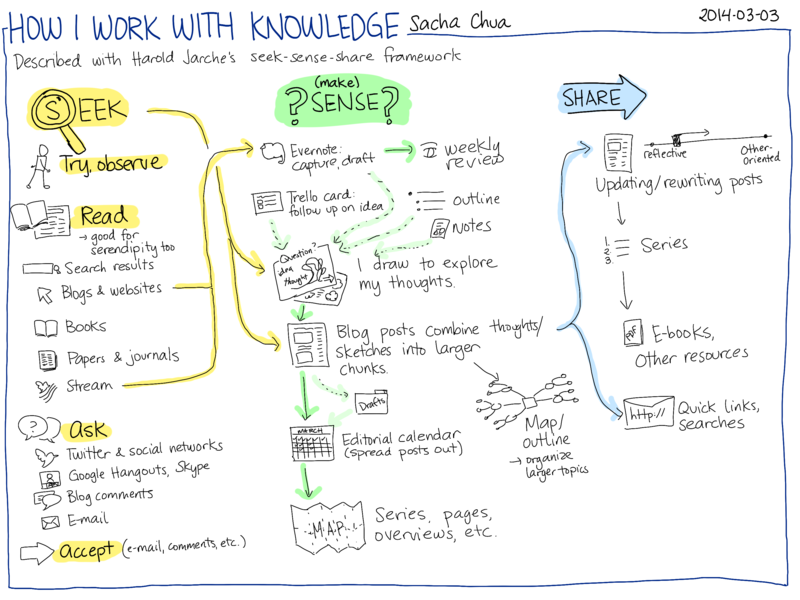 I can combine many sketches into one blog post, and then use a sketch to map out the relationships between ideas. I’m learning how to organize my posts into series. A better writer would plan ahead. Me, I usually work backwards instead, organizing existing posts and tweaking them to flow better. When I get the hang of series, I’ll be able to start thinking in chunks of short books. I have a regular review process. I do weekly reviews of my blog posts, sketches, reading, and time. I do monthly reviews and yearly reviews, rolling the summaries upward. I’ve written some scripts to simplify this process. For example, I read blog posts with the Feedly reader. If This Then That imports my Feedly saved items into Evernote. I have an Emacs Lisp function that reads Evernote exports and formats them for my blog, and then I annotate that list with my thoughts. Even with this review process, I can’t remember everything I have in my archive. Fortunately, I’m a geek. I like building and tweaking tools. I’ve written about the different things I do to make it easier to go through my archive. I can find things faster thanks to little things like having a browser search keyword for my blog. Recommendations for similar posts help me find connections that I might not have thought about myself. 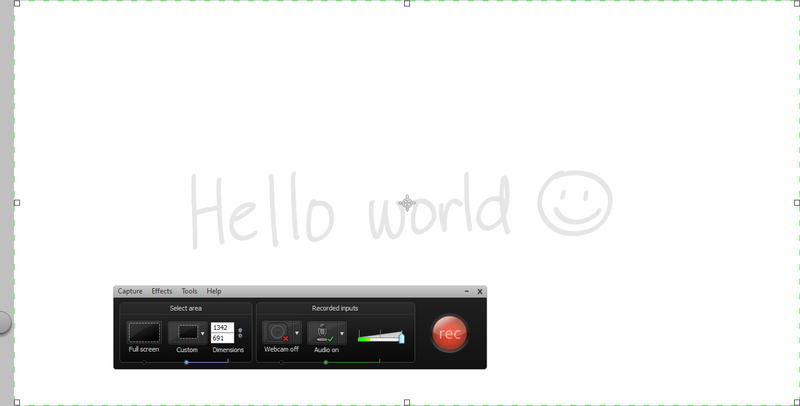 One of the unusual things I’ve been experimenting with is delegation to a team of virtual assistants. I ask people to research information, summarize what they find, and draft posts. I can find things faster myself, and I can write pretty quickly. Still, it’s a useful way to learn about things from other people’s perspectives, and I hope it pays off. My website is the base for all my sharing. Having seen so many services come and go, I don’t trust anything I can’t back up and control. I keep most things in a self-hosted WordPress blog. I also use Google Drive for easy, granular sharing (such as my delegation process folder), and Dropbox for other features. 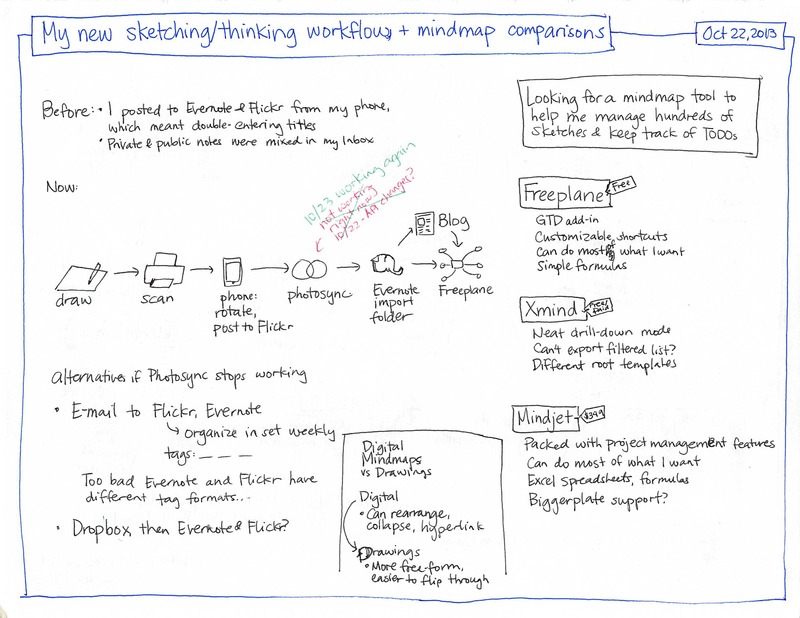 I keep a copy of my sketchnotes in Evernote for convenience, and I share those notebooks as well. 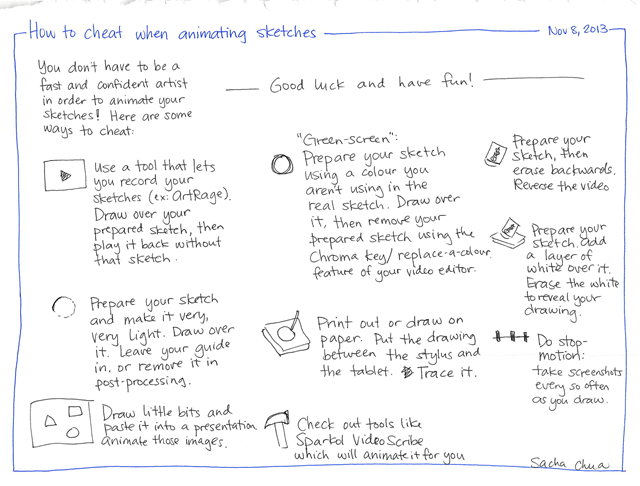 See my sketchnotes, sketchbook, and visual vocabulary. Google Hangout on Air is great for recording podcasts and video conversations. The broadcast is available as a live stream, and it’s automatically recorded too. I’ve been moving more of my conversations to Hangouts on Air so that other people can learn from them. I don’t want to clutter my main Twitter account with automated posts. 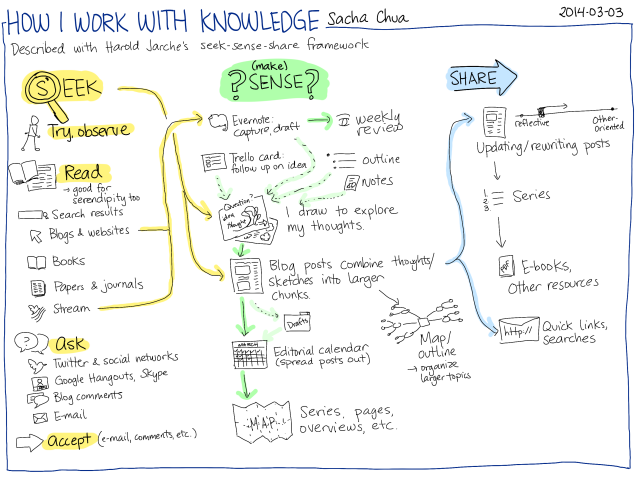 I use @sachac_blog for blog post announcements. On occasion, I’ll post links or sneak previews with my main Twitter account, @sachac. For free/pay-what-you-want resources, I use Gumroad. I like the way that it lets me offer digital resources while giving people a way to show their appreciation. I’m also experimenting with paper books using CreateSpace. 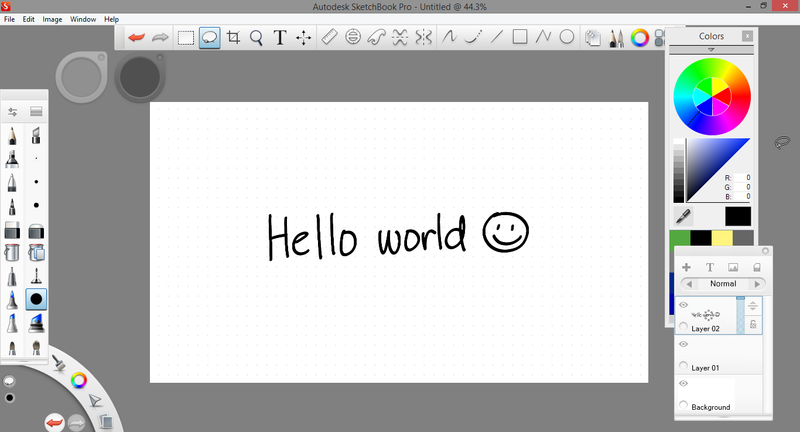 I’m looking forward to releasing some sketchnote collections through that. How about you? How do you work with what you know? Check out Harold Jarche’s post, too: What is your PKM routine?. Want to watch our conversation about large blog archives? See Youtube video below. Google Hangouts On Air is a quick, free way to have a videocast with up to 10 participants and as many passive watchers as you want, thanks to streaming through YouTube. The stream is about 20 seconds delayed and the commenting interface is still kinda raw, but as a quick way to set up and broadcast video chats, it’s hard to beat that. 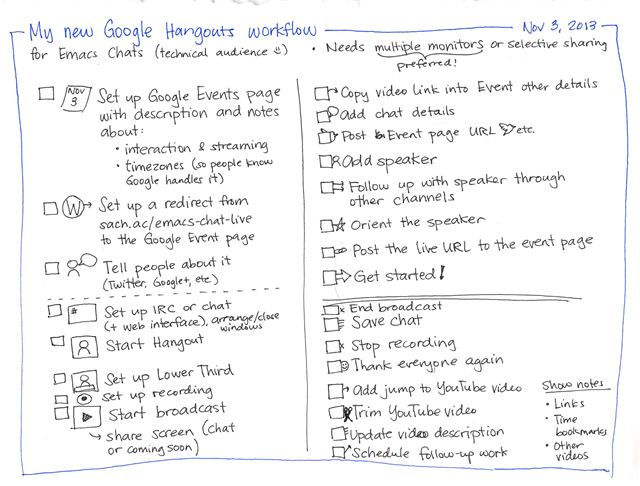 I picked up a lot of great ideas from Pat Flynn’s first Q&A Hangout. He used ChatWing to set up a chat room that everyone could join, and the experience was much smoother than using CommentTracker or something like that. The other new thing I tried this time around was starting the broadcast really early (like, half an hour early) and setting it to share my screen with the coming-soon information, which meant that I could post the streaming URL in lots of different places. I’d like to expand this to doing regular Hangouts On Air Q&As or conversations. How about we use the sach.ac/live URL to point to the next Hangout On Air I’ve scheduled? As of this writing, this will be a Q&A on November 29 on learning and note-taking. We’ll probably stream it over YouTube and have a chat room for discussion/Q&A. Want to pick my brain? See you then! I draw a thought on paper using black, blue, red, and green pens. Photosync automatically downloads the images from Flickr to folders monitored by Evernote, so they’re imported into my !Inbox notebook. 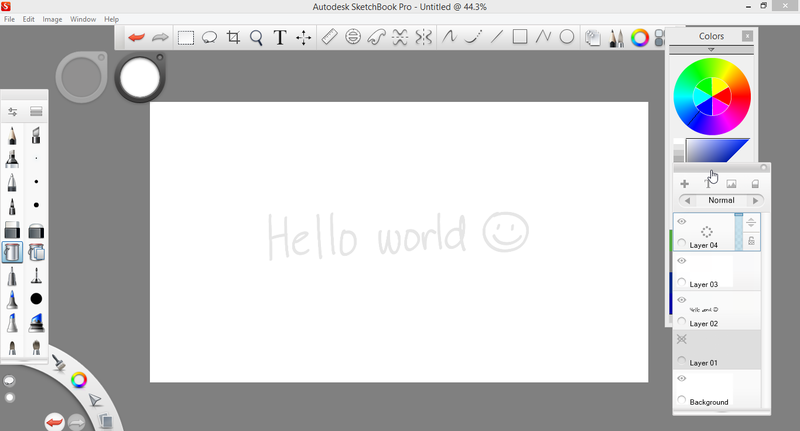 If I want to colour the image, I use Autodesk Sketchbook Pro and re-save the JPGs to the Evernote attachment folder as well as the Photosync folder, which updates the Flickr image. 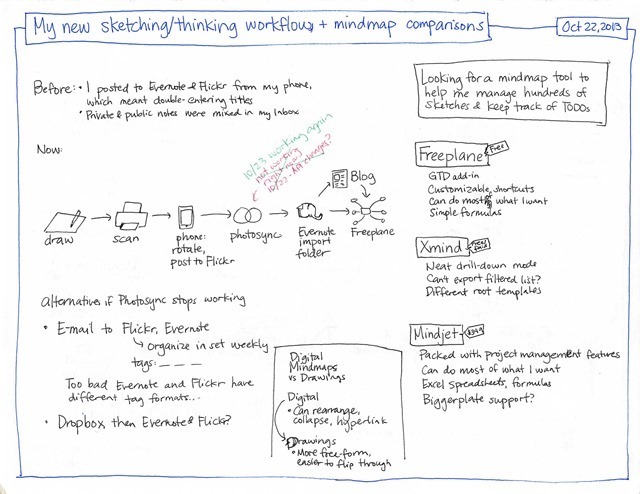 Before I move the Evernote item to my public notebook, I tag it, copy the note link, and add the entry to my Freeplane mindmap so that I have a hyperlinked overview (sneak preview of my map: Mapping what I’m learning). One of the nice things about a limited canvas (whether paper or digital) is that there’s a natural end to your drawing. You run out of thoughts or you run out of space. Either way, that’s a good time to stop and think about what you need to do next. In a text outline or a mindmap, I can just keep going and going and going. I’ve been thinking about how I can do things even better. As it turns out, assigning Autodesk Sketchbook Pro as the default application for handling JPGs lets me easily edit images stored in Evernote. Freemind lets me add markers to map nodes, so that’s a halfway-decent flagging system (no electronic equivalent of Post-It flags on the image itself, though). I’m looking forward to turning this kind of focus on something that isn’t related to learning or drawing. 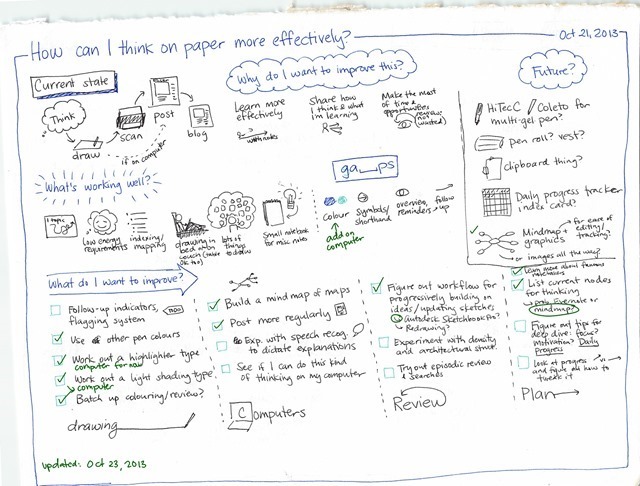 It’ll be interesting to see if visual thinking does well for deep dives in other areas too, although I suspect it will. 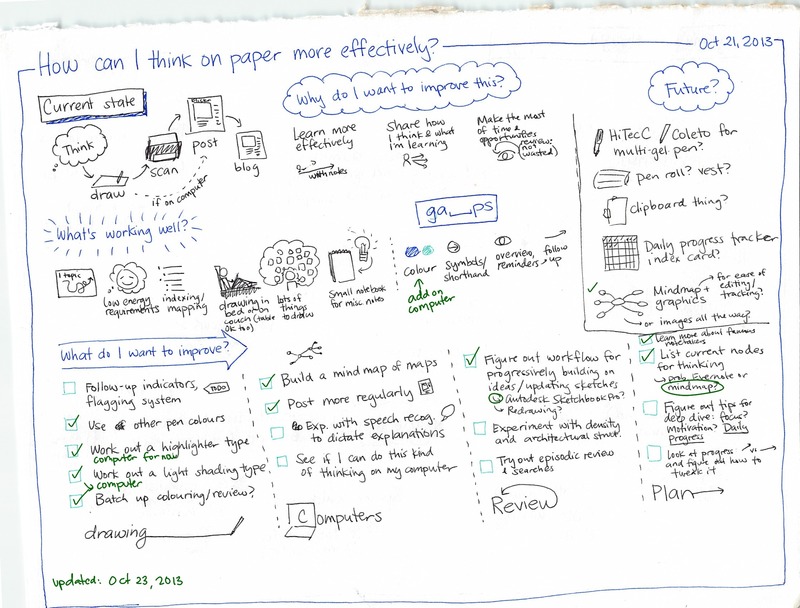 Check out my Evernote resource page for the one-page summary and Q&A. Enjoy!